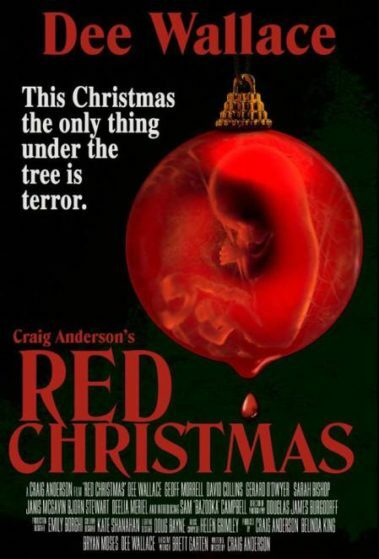 Christmas Horror? Dee Wallace? Buckets of Blood? Those few things alone will easily draw attention to the horror community for this NEW film from Australian TV director Craig Anderson! What happens when Ozploitation meets the Holiday slasher? This is definitely the first time I remember seeing them mixed together. I am fond of holiday horror especially two particular holidays (Halloween & Christmas) which seem to produce the best outcomes over the years especially X-Mas stuff like Black Christmas, Christmas Evil, Silent Night Deadly Night, To All a Good Night, All through the House, P2, Jack Frost, Dead End, Don’t Open till Christmas, Krampus, Silent Night Bloody Night, A Christmas Horror Story, & many others. Scream Queen & the Ultimate Horror mom Dee Wallace (Cujo, The Howling, The Frighteners, Critters, The Hills have Eyes, Popcorn, Rob Zombie’s Halloween, & E.T.) stars as Diane, widower & the mother of a dysfunctional family that’s coming together for Christmas. You witness the typical discussions & arguments between this colorful family during the holidays as you would expect. Unlike most of the other displays in this long lived genre most of this family is actually likeable & you are not rooting for them to be picked off one by one which is a nice surprise since it rarely happens. A stranger approaches the door as the family is enjoying their holiday asking if a certain person resides there. I find it very interesting how easy they accept a tall strange looking guy hidden in bandages & a cloak with a letter saying “mother” into their home like he’s some friendly neighbor. LOL Obviously, there is something wrong with this man but they let him go inside to get warm & start trying to talk to him. The family feels sorry for the stranger & gives him a gift, he starts to read the letter to everyone. It strikes a NERVE with the mother & she quickly kicks him out of the house. This sets off a chain of events that will make this night one to remember forever. Family members start missing, Diane & others are forced to protect themselves in her house against this mysterious visitor. This becomes a home invasion/survival film where many of the characters meet a GRUESOME demise. I won’t say all of the kills were innovative because I’ve seen variations of them in the past but they were all well executed in this. 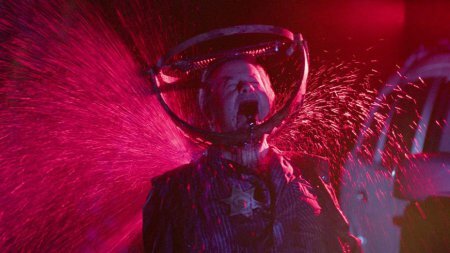 The special effects & gore were VERY impressive which ALWAYS elevates something like this. TOP NOTCH cinematography by Douglas James Burgdorff who provides a colorful & stylish film to viewers. Abortion is a VERY controversial subject which happens to be one of the the main themes & motivations for film’s monster Cletus. This is a unique character, you don’t see that many with down syndrome taking revenge in this genre. 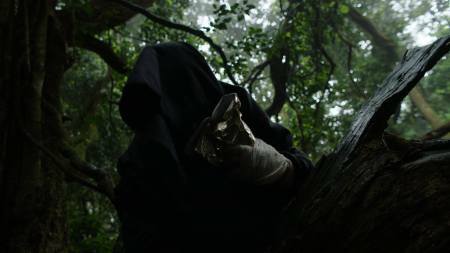 How many times have you seen the villain resembling the Grim Reaper slashing his victims one by one? So it REALLY stands out from the many other slasher movies out there especially right now. 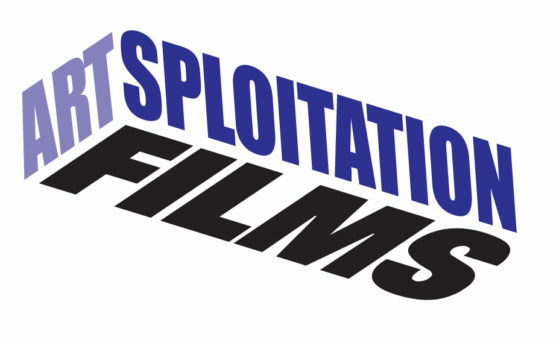 In this modern day, it’s hard to find quality independent horror so I am VERY thankful to Artsploitation Films who consistency provide GREAT films to the underground. The extras on the blu ray include: A feature-length commentary with writer-director Craig Anderson, Bloopers, Interviews with Dee Wallace, Gerald Odwyer & Craig Anderson. 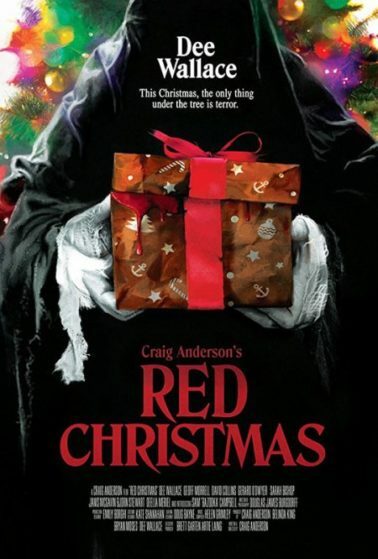 Austrailia’s TWIST on the Holiday Slasher! HIGHLY recommended especially to Dee Wallace fans, this is her BEST performance in over 20+ years!